The parameter settings of the sender, set via AI Enabler, form the functional context of a Rule Engine session. These settings are built in sys.dat by extraction from the sender. This section discusses the assignment of values to these parameters to allow you to easily check the validity of the functional context by reference to the parameters defined in AI Enabler for the sender before extraction. To activate a given function, you often need to supply several parameters belonging to different sections. The following illustration shows the keywords that you need to supply in the various cases in the different sections of the functional context. The details of the keywords in script.ges are explained in the following chapters. The keywords of the functional context are divided into sections. You assign values to all the keywords for a given sender by appending the name of the sender to the section name.>Section_Name.Sender_Name<For example:>Choice.SENDER1<Aggregation=NoKeywords belonging to one section cannot be associated with another section. You must not changes the names used for keywords and sections. You assign a value to each keyword that you want to use as follows: keyword_name = keyword_value. Tabulated values are not allowed. The spaces between a keyword and its value are not significant. To comment out an unused keyword, precede it with a hash (#) sign. When you do this, the system uses the default value. Keywords are not case sensitive. For example, redirection is the same keyword as Redirection or REDIRECTION. The values that you assign to keywords ARE case sensitive and are applied exactly as you enter them. For example, hello, Hello and HELLO are three different values. An IEvent type version is defined by a date as follows, each IEvent type version being defined for one (or more) specific validity periods. 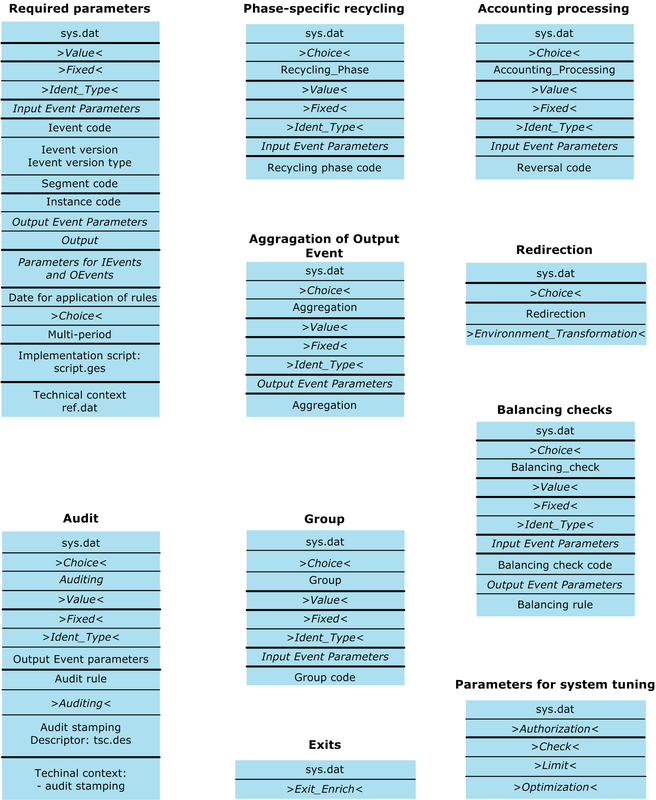 This section explains how Rule Engine identifies the various fields that characterize an Input-Event. These methods of identification flow from the structures that have been defined for Input-Event segments. Maximum length = 3 for a numeric or 10 for a date. Numeric or date, depending on the type. If one or more versions of the Input-Event type to be processed are valid over more than one period. The table below shows the parameter settings that allow Input-Events with more than one segment to be handled. Note A segment with a blank instance code is treated as a mono-segment Input-Event. This gives the flexibility to process mono and multi-segment Input-Events in the same session. A multi-segment Input-Event may contain up to 999 segments. These settings limit Rule Engine to handling Input-Events comprising a single segment. In this case the instance code in an Input-Event is not used. This section explains how Rule Engine identifies the output code that characterizes an Output-Event. This method of identification flows from the structures that have been defined for Output-Events. This section explains the DAR identification method. This information is required for the rules that are associated with the Input-Events and those associated with the Output-Events. Supply the operational date of script.ges. See table below.